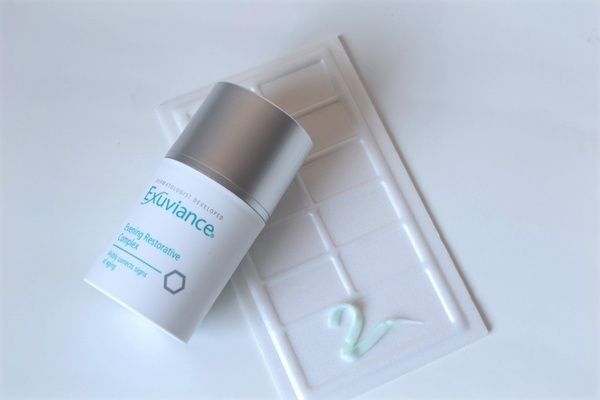 The huge selling point for the Exuviance Evening Restorative Complex is their prime ingredients Gluconolactone and Lactobionic Acid which is both in the Polyhydroxy Acid family (PHA). PHA is known to target lines, perhaps increase collagen production, and stimulate cell turnover. This is a great anti-aging cream. Polyhydroxy Acid is useful in helping the skin reverse the signs of aging. There have been numerous clinical studies to evaluate the beneficial effects of Polyhydroxy Acid in skin care. The study proved that PHA worked well when it came to antiaging benefits to skin, and it helped make the skin resilient. I am in my early 30's with no signs of wrinkles or crow's feet, but I think it is imperative to start with your anti-aging skincare routines at a young age. This night treatment conditions and hydrates skin with emollients and Hyaluronic Acid, restoring youthful suppleness and elasticity. Powerful Polyhydroxy Acid (PHA) Gluconolactone targets lines and wrinkles, evens skin tone and improves roughness and texture. Lactobionic Acid - a potent antioxidant - helps inhibit wrinkles from forming, plumps and firms the skin, and enhances clarity. This bionic blend of PHAs, along with botanicals and Vitamins A, C, and E, delivers full-strength antiaging benefits without drying or irritation, even on the most sensitive skin types. Evening Restorative Complex is dermatologist developed and gentle enough to be used following Glycolic Acid Peels and Microdermabrasion. 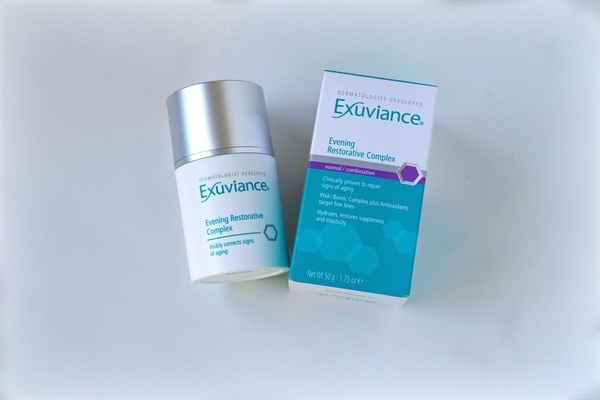 Exuviance Evening Restorative Complex is clinically proven to reduce the signs of aging and strengthen the skin's protective barrier. The Evening Cream is thick, pale blue in color, and has a nice light floral scent. I love the fragrance of this cream because for some reason it calms me and eases me into the night. I typically do my night time routine an hour before I go to bed, this way, the products are still working as I doze off. The fragrance is almost like aromatherapy for me. 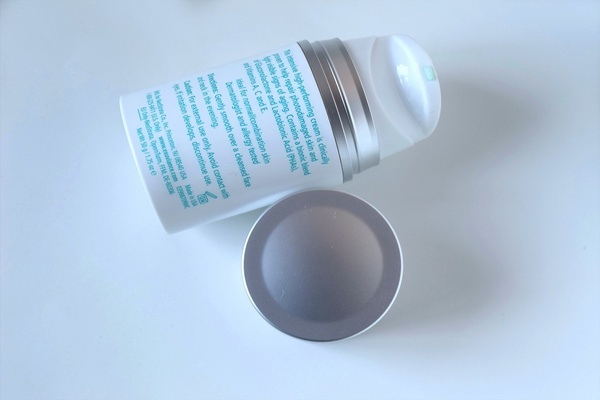 But, I must point out that if you are sensitive to fragrance in skin care products, then the fragrance in this product might be a bit bothersome for you - But, the results you get from using it is so worth it at the same time. Best night cream for face. How to use: I gently smooth over my cleansed face and neck in the evening. One pump is all I need for my whole face. It smoothes nicely on the skin, and the texture is that of silk. 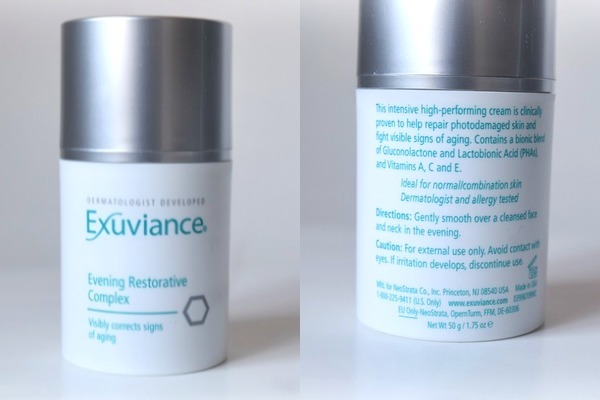 If you are looking for an evening cream to add to your nighttime skin care regimen, I recommend you give Exuvinace Evening Restorative Complex a try. It is the best night cream on the market. I am sure you will love it as much as I do. Subscribe to the blog for more beauty post.